Recently I saw a drawing challenge posted by a site called OzComics on Facebook calling on artists to post their own interpretations of Stan Sakai's beloved comic book character "Usagi Yojimbo" and I just had to toss one in! I love Usagi and have a collection of the books (not quite all of them yet, but working on it) which are wonderful tales told by a master storyteller. This was the drawing I did for the challenge. It took about an hour and a half...and he turned out looking too much like the Grinch to me, but all in all, it turned out pretty well. I even received a kind compliment form the samurai rabbit's creator, which was a real treat! 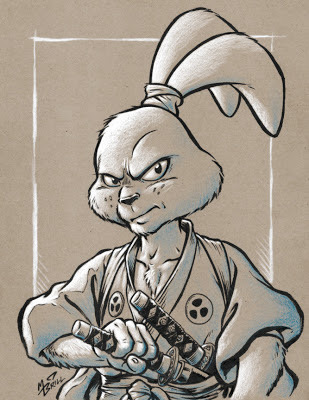 Thanks Stan Sakai for giving us over 25 years of Usagi's adventures!